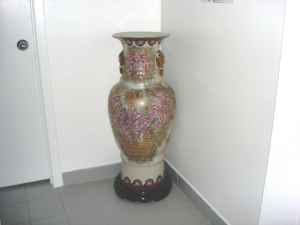 I saw your ad on craigslist for the "Big Vase" http://toronto.en.craigslist.ca/tor/for/1157481114.html . I was just wondering if you could provide me with some proof that you have not just built a miniature house to enclose a small vase, thus making it appear to be a BIG vase? Perhaps you could take a photo of it next to something which would be harder to counterfeit. I guess the easiest thing to do would be to try to get a photo of the vase next to a celebrity of known size. That would be very hard to counterfeit. It seems as though you are in the Toronto, Canada region so perhaps Celine Dion or Bryan Adams would be best. if u could wait until next week we could bring in Bruce Willis or Clint Eastwood... lets us know so i can dismantle my miniture house, thx.